This week and next week we’ll revisit some of the top posts from 2017. This post about Mr. Roger’s quote was originally posted in 2014 but it’s still one that you, my followers, and guests to my blog consistently search out. My thought on the continued popularity of this post is that we all need to be frequently reminded that we’re fine just the way we are. Sure, we have shortcomings and we aren’t perfect, but on the whole, we’re pretty darned cool in our own way. And “our own way” is just fine because Source has crafted us perfectly to lead our individual life. Happy Birthday, Mr. Rogers! Today (March 20, 2014) would have been his 86thbirthday. One of the most memorable statements Mr. Rogers would often say is “I like you just the way you are.” What a relief to have someone say that to you! What a gracious gift saying it to someone else—even if you don’t particularly like the person. That last sentence sounds contradictory but think about this: Most of us have struggles and we’re sometimes amazed to have made it through the day. Most people are buried under piles of “you should, you ought to, and you’d better”. It could be that we aren’t seeing the real person so we don’t really know if it’s them we don’t like or the way the pressure is twisting them that we don’t like. Also consider this: There are different levels of ‘like’ ranging from the kind of like that’s a common respect of all living things to the type of like that’s deep admiration, bordering on love. So, when you say to a person, “I like you just the way you are”, it’s okay to intend it in a respectful way rather than meaning you’d like to be the person’s best friend. More importantly, though, think about what it could do for the other person to hear someone say “I like you just the way you are”. For a moment, they can let go of their burdens and cares; they can just be—maybe even take a breath, something they may not have done in a long while. You saying “I like you just the way you are” can be a healing touch to a place inside them that’s been hurt too long. Saying “I like you just the way you are” can have magical and miraculous results. 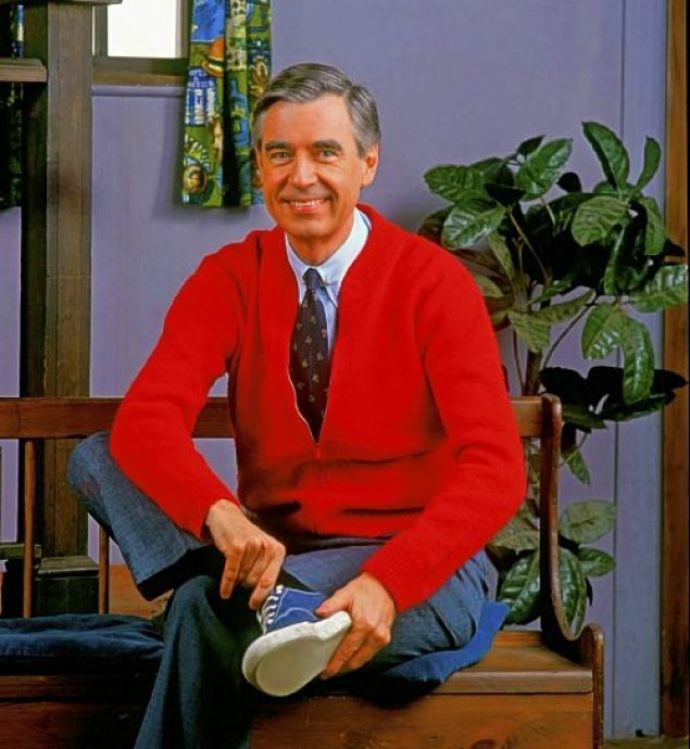 Your homework today is to join the many others’ in honoring Mr. Rogers’ birthday by putting on a sweater. Be a good neighbor to someone by saying “I like you just the way you are”. The second part of your homework is to go to your mirror, look deep into your eyes, and say to yourself “I like you just the way you are”. Give yourself a big smile when you say it! I LIKE YOU JUST THE WAY YOU ARE!! I think you’re awesome! This post is still as relevant today as it was over three years ago. We all need to hear that we’re a-okay in spite of the mistakes we’ve made and the times we didn’t come through for friends, family, neighbors, co-workers when we know we should have. Each day is a clean slate and an opportunity to start again. Start it out with one of Mr. Roger’s most famous statement: I like you just the way you are!